Gleaning. A word I had never heard of until yesterday, and coincedently, today we were generously given an opportunity to glean. At a cherry orchard no less. That is, to collect leftover cherries after the paid pickers have been through. Some trees had nary a cherry left, but others had some extremely well hidden ones. If you stuck your head right into the tree and looked up you could see, hiding amongst the leaves, large, dark, juicy orbs just waiting for us to pick. Like the most delicious treasure hunt. 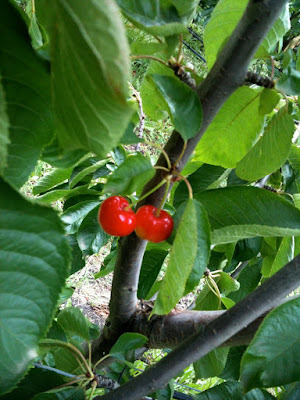 I even found a couple of white cherries, which are super sweet and juicy. After gleaning two or three rows of different varieties : Stella, Vans, Lapins, we had all filled our buckets. With plenty of quality control testing along the way. We also had a tour of the packing shed, to see where the cherries are washed, sorted and packed before flying off to the mainland. A huge operation, with up to 400 people picking or packing during the short cherry season. Now, what to do with 3kg cherries? I will bottle some, to eat in the winter, perhaps try to dry some, but mostly, they are delicious just as they are. And gleaning, there is more later this week, with a friend inviting us to glean at their black currant farm. 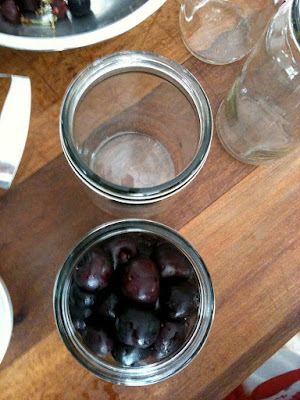 I'm going to try and make cassis with those. And that, dear reader is what I love the most about summer in Tasmania, all the delicious fruit. And it's even better when it's gleaned! Cherrio! The only 'gleaning' I had heard of was the tile of a Van Gough piece, and now it makes sense!! I never thought to question it til now. I'm wondering if that shirt Hugo is wearing still looks so clean, I've had to implement a strict no-shirts-cherry-eating policy! I have never pick my own cherry at the orchard. I bet it is quite fun, esp as a family outing with kids. I bet your kids had a ball. Btw, I think I ate so much cherry this season that I may end up with a nightmare, like that movie in "The Witches of Eastwick", with Jack Nicolson, Susan Sarandon, Cher. cherries are fantastic-every time I feel envious of people in the Tropics with their mangoes, I have to remind myself just how lucky we are here, to have all the stone fruits, pears, apples and berries. The opposite extreme also- have you read Monty Don's Ivington Diaries? Can't believe just how cold it gets there, it's amazing he can grow anything! I have just come in from picking my first plum...yum!! Nothing better than fruit of a tree!!! Yummo!that looks like one fabulous expedition.How nice to have some bottled up for the colder months. 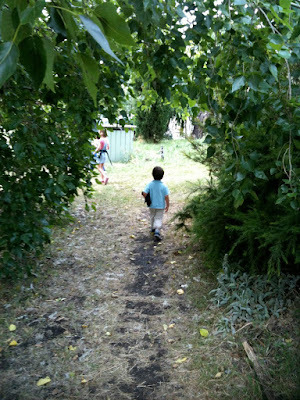 We have been cherry picking in the Adelaide Hills and it certainly was a wonderful day. Oh how delicious! I love cherries! I love the top photo where he is in the orchard. Sounds like a really great kiddie involved activity!